MTM Physiotherapy Warwick, situated inside the newly renovated Warwick Stadium, is conveniently located to deliver all of your Kingsley Physiotherapy needs. Since opening the new practice in February 2016 the team at MTM Physiotherapy Warwick have been providing services to those who live in Warwick as well as the neighbouring suburbs of Greenwood, Madeley, Darch, Carine, Duncraig, Hamersley and Marangaroo. Located within an 8-minute drive from the heart of Kingsley, we are well placed to service your local community. MTM Physiotherapy Warwick are proud to support a number of local sporting clubs including the West Coast Warriors state league netball team and the Northern Stars Volleyball Club, with a number of players, coaches and supporters calling the Kingsley region home. The physiotherapists at MTM Warwick strive to provide high quality Physiotherapy and have experience in treating a wide range of musculoskeletal conditions. Our physiotherapists seek to continually broaden their physiotherapy knowledge by undertaking regular professional development to ensure their patients receive the best possible care. Your experience at MTM Physiotherapy Warwick will include a thorough musculoskeletal and functional assessment using a combination of the Warwick Stadium gym and court facilities as well as our treatment rooms. This enables us to carry out a more detailed examination of your movement patterns related to your daily pursuits. With access to the state of the art Warwick Workout gym, the team at MTM Physiotherapy Warwick are able to develop individualised exercise rehabilitation programs to prepare you for return to your usual activities following acute injury or surgery or to assist in managing chronic conditions. 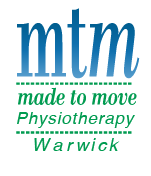 If you have any questions, please feel free to give us a call and speak to one of our friendly MTM Warwick Physiotherapists today!